You'll be £12.99 closer to your next £10.00 credit when you purchase Isandlwana. What's this? The story of the mighty imperial British army's defeat at Iswandlwana in 1879 has been much written about but never with the detail and insight revealed by Dr Adrian Greaves' research. In re-constructing the dramatic and fateful events, the Author draws on recently discovered letters, diaries and papers of survivors and other contemporaries such as Henry Harford, Lt Henry Carling of the Royal Artillery, August Hammar and young British nurse Janet Wells. These, coupled with his own detailed knowledge of the ground, enable the Author to paint the most accurate picture yet of this cataclysmic battle that so shamed the British establishment. We learn for the first time of the complex Zulu decoy, the dishonourable attempt to blame Colonel Durnford for the defeat, evidence of another 'fugitives' trail'. The identity of previously unknown escorts for Lts Coghill and Melville, both awarded VCs for trying to save the Colours. 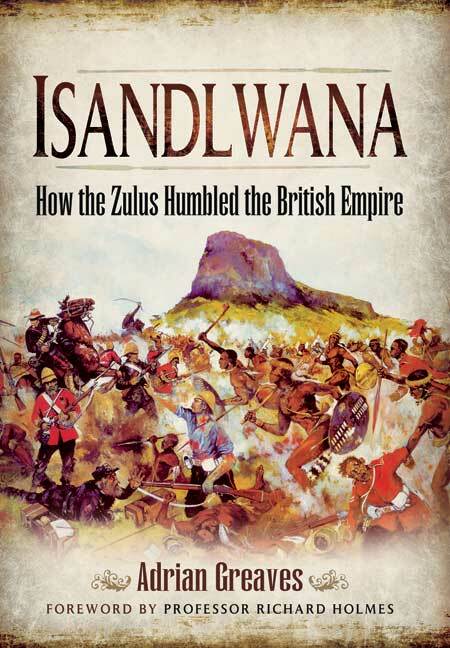 Isandlwana is a brilliant and fresh account of this most famous battle which will fascinate experts and laymen alike. Greaves has done a good job studying this topic and throwing new light onto the subject. I have really enjoyed this book. It has cleared a few things up and cemented much i did know. I have read and treasure a number of zulu war books and this one will be going on the pile. This fantastic read by Adrian Greaves makes a solid stab at clearing up all the myths about Isandlwana. Events at Rorke's Drift and a succession of other bloody encounters are alluded to but not described. The Battle of Isandlwana sent a shockwave through the colonial communities of South Africa and across the world to London, the hub of the Empire, where the news was treated with immense shock. This is Adrian Greaves second book on Isandlwana. His first – written at the invitation of the late Professor Richard Holmes – was published and well reviewed in 2001. In re-constructing the dramatic and fateful events of 22 January 1879, the author draws on recently discovered letters, diaries and papers of survivors and other contemporaries. Greaves has a very detailed knowledge of the battlefield and the surrounding area, and has been involved in some major surveys of the area, making discoveries that are incorporated in this book. He has been studying the Anglo-Zulu war for over twenty years, and this shows in his mastery of the original sources on both sides. Greaves' main argument is that the Zulu victory owed more to their own bravery and the plan adopted for the attack on the British camp and less on British defeats made during the battle. His knowledge of the sources, the battle and the battlefield add a great deal of credibility to his arguments and make this a very valuable book. evidence for another 'fugitives trail'. Well researched, and informative; this is a book for anyone interested in military or African history. 3 stars. Fought Jan 22, 1879, Isandlwana was the first major battle of the Anglo-Zulu War, and it was a catastrophe for the British Empire. Lord Chelmsford had invaded Zulu-land 11 days earlier. A Zulu imp of about 20,000 warriors attacked part of his main comlumn encamped at Isandlwana and killed about 1,300 British regulars, European colonial troops, African levies and civilians. It was the worst defeat an indigenous foe ever inflicted on a technologically superior British force. Zulu King Cetshwayo had hoped for a negotiated peace. But the stunned British exacted revenge by mounting a heavily reinforced second invasion and aggressively pursuing the conquest of the African kingdom. Though the British ultimately pre-vailed in the war, the profound nature of the defeat at Isandlwana has never been forgotten. It has been the subject of countless books and was depicted on film in "Zulu Dawn". In our hobby, the battles has inspired many a toy soldier and model figure, most recently by makers such as W. Britain, Little Legion Toy Soldiers and The Collectors Showcase. Certainly the clash has been well-documented through the years, yet author Dr. Adrian Greaves manages to deliver new insights and intriguing details in "Isandlwana: How the Zulus Humbled the British Army". The author's research included drawing on recently uncovered letters, diaries and papers of survivors and other contemporaries such as Capt. Henry "Charlie" Harford of the 99th Foot, Royal Artillery Lt. Henry Curling, August Hammar and young nurse Janet Wells. Their accounts have been combined with Greaves' expert knowledge of the ground to reconstruct the fateful events behind this military disaster that badly embarrassed the British establishment. The author describes an intricate Zulu decoy, investigates an attempt to blame the defeat on Col. Anthony Durford and finds evidence of another "Fugitives' Trail". Greaves also identifies the escorts for Lts. Nevill Cognhill and Teignmouth Melvill, who were killed trying to save the colours and became the first soldiers to be awarded the Victoria Cross posthumously. Sixteen pages of black and white plates are included in this hardback book's 224 pages. This book's fresh details, anecdotes and evidence make it a worthy addition to the library of anyone interested in the circumstances of this 19th-century battle and the war that triggered it. This new book is required reading for anyone who is interested in the Anglo-Zulu War. Highly Recommended. Pen & Sword have again produced a highly readable book, of excellent quality, that will appeal to anyone with an interest in the military history of this period, as well as those with particular interest in the Anglo-Zulu wars. Heartily recommended. This volume comes highly recommended. It is written in an easy to follow manner and it gives admirable treatment of the situation prior to the Battle, the Battle itself and post-Isandlwana incidents. The author has done a great service to this topic and no doubt this volume will become a superb addition to any library on this campaign. Dr Adrian Greaves FRGS, a former soldier and senior police officer, has devoted the last 20 years of his life to studying the Anglo-Zulu War. He is the founder of the Anglo Zulu War Historical Society, the author of numerous works including the bestselling Rorke’s Drift ( ) to which this book is a worthy companion. His books, The Curling Letters of the Zulu War, Redcoats and Zulus, Sister Janet, Who’s Who in the Anglo-Zulu War (2 volumes with Ian Knight) and David Rattray’s Guidebook to the Anglo-Zulu War Battlefield (Editor) have all been published by Pen and Sword Books Ltd.